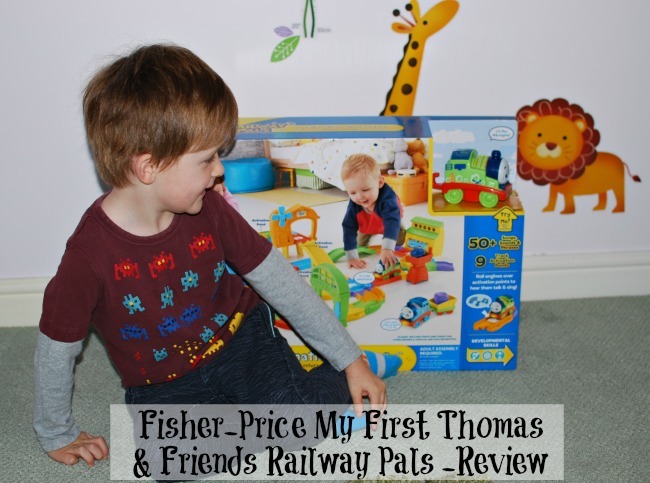 We were so pleased to be sent a Fisher-Price Thomas & Friends Playset to review. Whenever Fisher-Price is mentioned I think quality toys. It was a brand we trusted when our children were little. 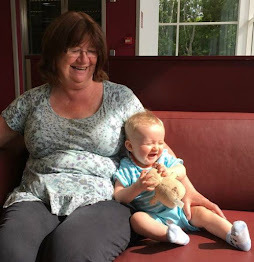 Now we have grandchildren we are always looking for toys that are fun, that inspire their active imaginations and if they encourage learning then that is a bonus. Bear put up with the obligatory sitting in front of the box for me to take a photo, but he couldn't wait to open the box. While I was trying (and failing) to get the perfect shot, Bear pressed Percy's light up bumper, (it's on the outside for you to try). Percy said one of the many phrases, I didn't catch what Percy said but Bear chastised it. That was the beginning of a day of make believe. Percy is a green saddle tank engine, his favourite job is to deliver the mail. Push him over the activation tracks and you can hear him say one of fifty different sounds, quietly. Oh yes, this doesn't shout, or screech, it just say's things. Sometimes you have to actually listen to hear what Percy has to say. 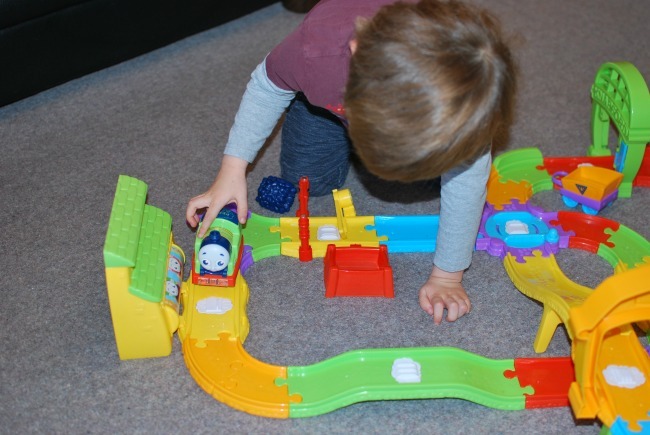 "take a rest under the tunnel"
"chuff along to the yellow track"
The Destination Discovery playset does need batteries, one for Percy (comes with the set) and two for the sidings. The sidings have lights that come on when the roller is spun, Percy needs his to talk. All movement around the track is person powered. I am guessing that the batteries will last for ages and even if they run out the toy can still be played with. The playset has over forty track pieces and there are instructions for three different layouts. Bear and I managed to complete one with me reading the instructions and giving Bear the pieces and him putting them together. That is one of the best things about this train set, a three year old can put it together and I think left alone could design their own track. The pieces fit together easily and do not fall apart. Bear pushed Percy around the track, listening to the sounds. Bear pushes Percy around the track. "He's taking the wheat to the miller to make flour"
Percy puffs up the hill to the arch with the windmill. The windmill goes around (with help from little hands) and Percy takes the flour down the hill to the station. "What now DaaDaa?" Bear looks at Grandad in expectation, Grandad doesn't disappoint. "The baker mixes the flour and the eggs together and makes cakes". Bear smiles knowingly, he nods. Bear knows how to make cakes. He knows about flour and eggs. This is real. He doesn't question an engine making cakes, or collecting eggs or delivering mail. Percy just does it. Bear pushes Percy to the tipper at the side of the track, he tips the coal into the trailer. Chuff, chuff....Percy is off on another adventure. He reaches the turntable, a hand from above comes down and turns the track with the engine on it and Percy is off again. Another adventure, another destination. I thought it was a great toy, It goes together easily, it does make a noise but it's not noisy. It doesn't fall apart when a toddler pushes it or leans on it. When it is not being played with, it is quiet! No random noises from this set. But it's not about me, OK I have to buy the batteries but what did Bear think? He would have played with it all day. 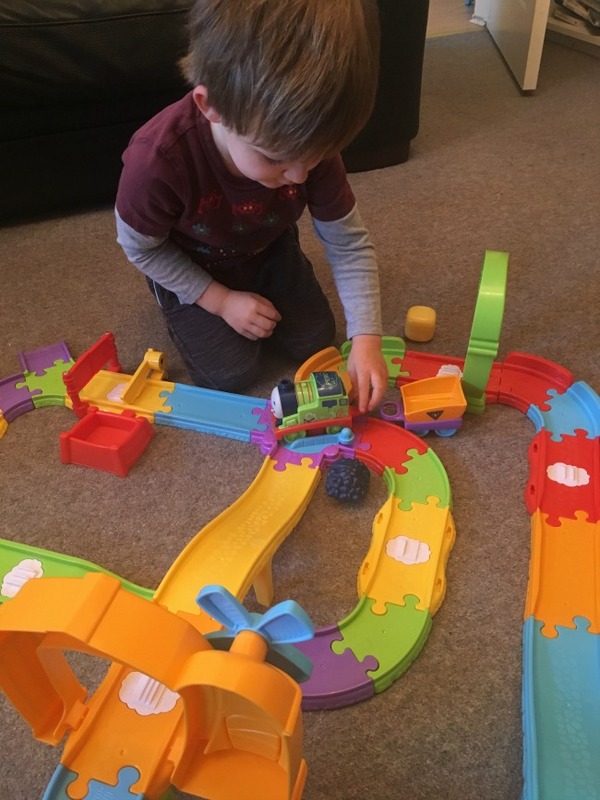 We opened the box after breakfast and set up the track, he played for a while then we went out as it was a gorgeous, warm, sunny day. As soon as we returned Bear played with it again. He didn't include his favourite toys (emergency service vehicles, a police car, ambulance and fire engine) he just played with Percy. 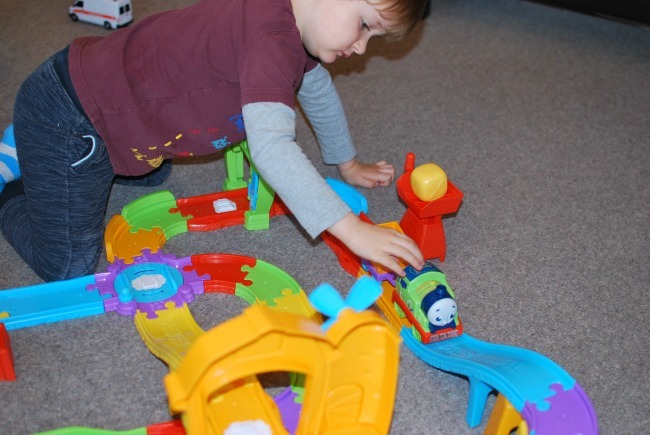 The train set is well made and Percy chuffs along with the help of little hands. The sounds are not too loud and conversations can be held above them. I do not really understand why there is a need for a battery in the sidings, there is a roller that clicks when turned and randomly lights come on for a second, and then off. It takes two AA batteries for these lights. Bear was bemused, I was grateful. I knew the batteries would last forever as he wouldn't use them up. 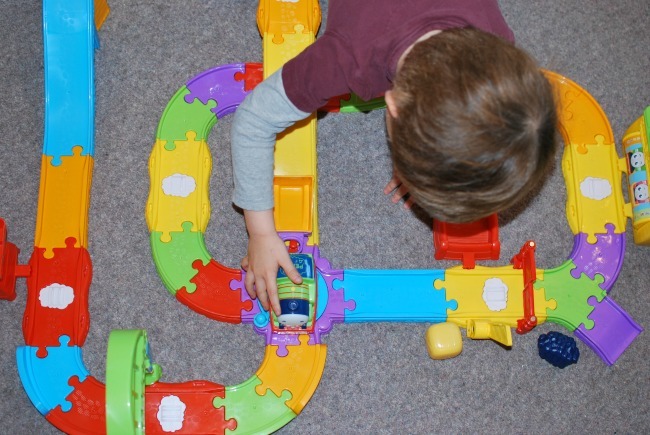 The trailer attaches to the engine with a huge loop and hook that even tiny hands can manage, but they cannot go around the corners together without derailing. This would have annoyed me, but not Bear. He seemed to understand that this happened and just carried on regardless. It's a great toy and any child would be delighted to have this as a gift. It costs £49.99 and is suitable from twelve months. *Disclaimer - We were given this toy for the purpose of this review. All opinions are honest and our own.